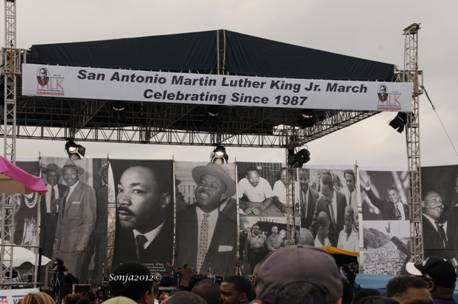 On January 16, 2012 with a light drizzle, over 100,000 people attended the Martin Luther King march in San Antonio, Texas. The march was contained on the East Side streets and ended at Pittman Sullivan Park where the crowd congregated for the festivities. This year’s slogan was ‘Journey Beyond the March…Live Beyond the Dream’ and was the 25th anniversary of the event. The two largest employers in San Antonio participated, HEB grocery stores and USAA, an insurance company. It is always a good thing to see a city come together to celebrate the accomplishments of a man who dedicated his life for the cause of civil liberties. The front row of recognizable marchers was Judge Michael Mery, Archbishop Gustavo Garcia-Siller, Henry Cisneros, Julian Castro and Tommie Adkinson. Sprinkled among the crowd were Congressman Charlie Gonzalez and more elected officials, which included Republicans celebrating this historic occasion. 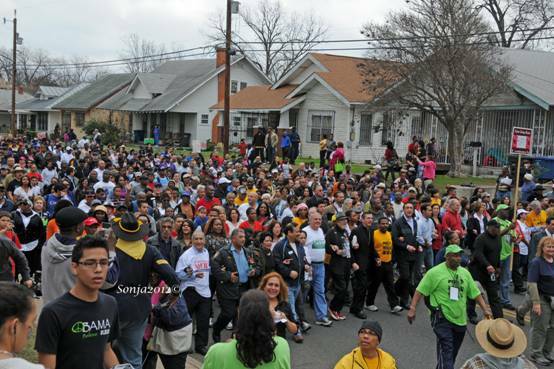 Among those marching and enjoying the moment were the dedicated MLK devotees, families and students out for the day. And there were those that are inspired by other issues like the War in Iran, Occupy San Antonio and those recruiting for legitimate reasons. Then there was the lone Muslim who asked me not to photograph his face but posed with his sign recruiting Blacks to learn Arabic. And of course, parades lend themselves for promoting political views. Walking among the crowd you would think that Obama had come through on all his promises. As there were chants of ‘four more years’, many wearing hats, tee shirts and some even carried signs with Obama’s face. It appears that Obama is still a favorite in the Black community of San Antonio. The stage was very impressive with the backdrop containing photographs of MLK, Coretta King, Obama, Louis Farrakhan and other Black heroes. Martin Luther King III addressed the participants after the march with an inspiring message. He told KENS reporter, Jeff Vaughn, that racism, poverty and militarism are the three evils that still need to be eradicated. What exactly did MLK III mean by militarism? That America is ‘struggling’ with racism when the president is Black and Black athletes dominate most of the major sports. Maybe the civil rights leader’s son should have mentioned that if anyone did not have a job they should have the initiative to start their own business or pursue an education. Congressman Charlie Gonzalez’s speech reeked of racism and echoed Eric Holder’s speech on the Voting Rights Act. His voice carried over the PA system blasting the Republicans by saying; “they” want to get rid of the voting rights act. While I admire MLK as a civil rights leader, it amazes me that Black leaders continue to promote a ‘victim’ mentality.